Why do us golfers do it? This ridiculous game of ours. The hours of practice, the blisters, the duffed shots, the wrecked scorecards… “It’s great,” we tentatively say as a par putt sails six feet by, “We like a challenge –” the returning bogey putt lips out, and we resist the urge to hurl the putter down the fairway. Come on, we’re kidding ourselves, right? No good can come from the effort of beating a tiny ball around a field until it blessedly disappears underground. It’s a mug’s game, played by the masochistic who actually pay for the privilege of this torture a couple of times a week. We’re either mad or just plain stupid. Maybe both. Then you find yourself in a place like Carne. Well, the place – there is surely no other course on the planet that can compare. It’s a lunar landscape of mountainous sand dunes colliding into one another, with a slip of fairway tumbling out of the commotion over the hills and far away. Golf like this isn’t created by man, it’s shaped by decades of ravaging winds, the relentless slap of the Atlantic on the coastline and the deft hand of a genius architect. It’s the kind of remorseless elements that drive the fair-weather golfer into hiding, but me? I’m delirious with the sheer excitement of striking the next shot. “There’s a bit of a breeze blowing out there,” Captain Obvious tells me in the Carne pro shop. Try 40mph gale-force winds, mate. Before heading out into the wilderness, there’s one must-play stop off before you hit the coastal roads. A short 30-minute drive from Shannon Airport, County Limerick’s Adare Manor is a five-star hotel that dates as far back as the 1860s – and, yet, it’s recent multi-multi-million pound renovation makes it one of the very best in the British Isles for 2018. The 842-acre property, owned by racehorse tycoon JP McManus, is a little reminiscent of Gleneagles in its confluence of old-world charms and modern touches, but its parkland golf course is a striking point of difference. The story goes that famed golf architect Tom Fazio was invited to consult on a small bunker restoration project to coincide with the hotel’s grand reopening in 2017, but he and Open-winner Padraig Harrington persuaded Mr McManus into rebuilding the entire golf course from scratch. 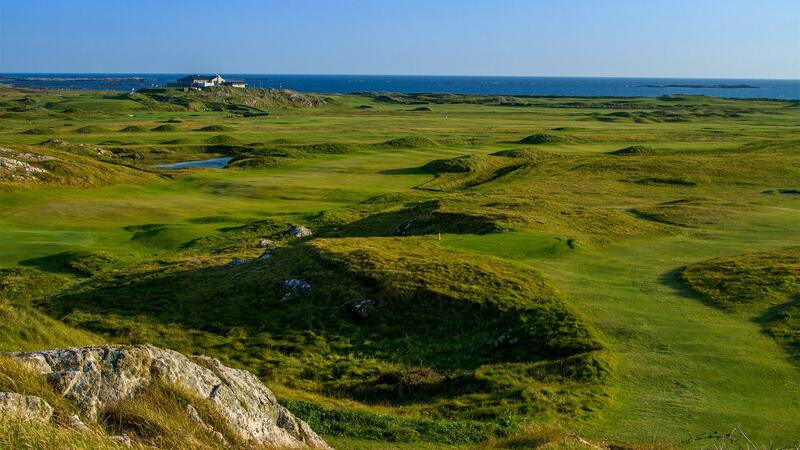 As an avid golfer, the Irishman couldn’t help himself: he signed a cheque for some £30m and watched his course transform into one of Europe’s most spectacular layouts. No, really, even that undersells the scale of this achievement. Fazio tore up almost the entire existing Robert Trent Jones Snr course to lay 77,000m of drainage and moved 220,000 tonnes of sand to alter the camber of the fairways. On the greens he laid 007 bentgrass (a tightly knitted turf that makes for a marble-like surface) and installed the first SubAir system in Ireland underneath (essentially, a big vacuum that controls the amount of moisture on the greens) to ensure the perfect putting surface in any weather conditions. Elsewhere, there are perfectly primped and preened bentgrass runoff areas – the kind of devilish feature that wreaks havoc on the PGA Tour – and a team of more than 50 greenskeepers repairing every single divot before golfers take to the course each day. As in a fine dining restaurant, when you’re playing the best golf courses it’s the minute details you don’t even notice that really add up to a world-class venue. 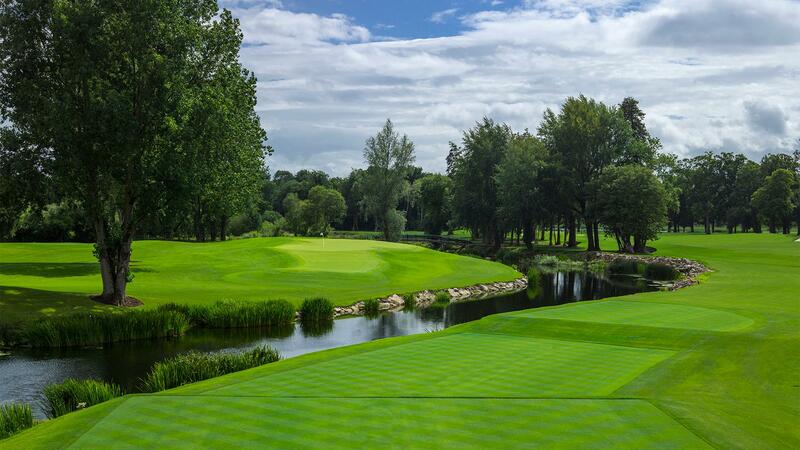 Early journalist reviews have quietly compared Adare Manor to none other than Augusta National, but it’s only upon walking the manicured fairways of the 12th and 13th holes that you begin to believe it: you can almost hear the faint roar of the Masters floating through the colourful trees. It’s unsurprising, really, that the Ryder Cup looks like a certainty in the not-too distant future. From the tips, the course stretches to an eye-watering 7,500 yards, with a high degree of difficulty, but the truth is this course was simply made to host a matchplay tournament. The drama of the water holes, the need to use almost every club in the bag – heck, Fazio installed fibre-optic cabling underneath the course ready for TV cameras. The par-five 18th hole is surely Fazio’s masterstroke. Playing back towards the manor house and into the wind, players must make the decision whether to go for the green in two or lay up and leave a tricky 120-yard pitch into the green. Either way, the River Maigue is the first line of defence – eagerly waiting for the slightest miscue short and right of the green. Miss the green to the left and you find yourself with a steep uphill chip with no protection from the water behind. It’s heart-attack city from tee to green. I celebrated par as if it were an eagle. Make no mistake, this is the best new layout in Europe, and likely to feature on your TV very soon. Pay the €340 green fee and the €55 compulsory caddie fee and play it for yourself: this is as good as it gets anywhere. Period. 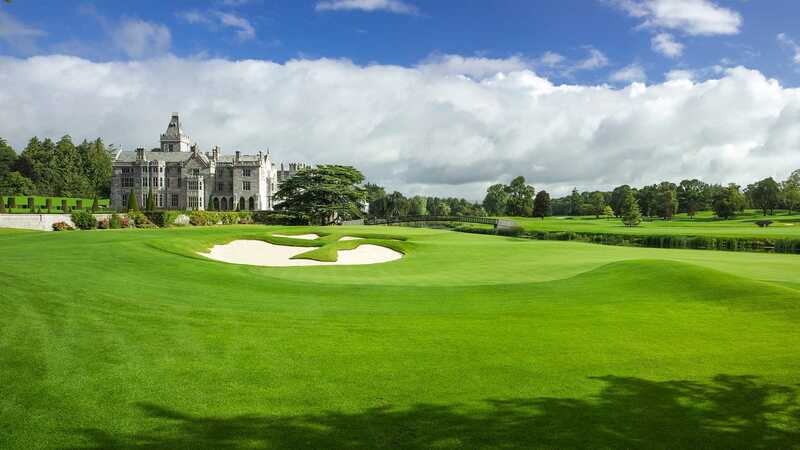 From the rolling fairways of Adare Manor, take the three-hour drive to Connemara Golf Links and you’ll find yourself in a different world entirely. This craggy terrain, set metres from the coast, is as harsh as links conditions get anywhere on earth. Without the sand dunes of other coastal courses, there’s very little shelter from the Irish gales that buffet you throughout the 18 holes. But you’ve come here for the challenge, not the sunshine. Exposed to the full force of the wind and driving rain, I wrestle with Connemara’s thorny exterior to get at the rose within. It doesn’t take long to reveal itself: the first hole snakes right to left through jagged clusters of rock and knots of rough to a rollercoaster green guarded by pot bunkers. There’s an ugly beauty to it that makes me think of the links golf our forefathers first invented in the middle ages. In an age of prim and proper golf in the sunshine, this is what golf was designed to be. It’s glorious. It requires careful planning and creative shotmaking to plot your way around Connemara. At 7,200 yards from the back, you’re likely to find yourself with a number of long iron second shots on the par fours, but flighting the ball low and using the roll of the fairways to bound the ball up to the green is perhaps a wiser way to approach the dancefloor than firing a four iron straight at the putting surface. It sounds like a hassle, but leaving the course wet, battered and bruised after relentless punishment from the weather still felt like a gift. That’s how good Connemara is. If Connemara is a remote setting for golf, Carne is on another planet. In Ireland’s extreme north west, just outside the tiny town of Belmulett, this fabled course has slowly grown to prominence in golfing circles for its one-of-a-kind experience. Some call it golf’s truest links test – a course entirely shaped by the elements – but I’d simply call it a near-religious round for those who truly love the game. If someone was to ask me the three layouts everyone should have on their bucket list, I’d not hesitate to say Bandon Dunes in Oregon, St Andrew’s Old Course and here. Set on the Carne Banks, this course was built by a brigade of farmers wielding shovels, hoes and rakes. Eight years later, Ireland’s greatest architect Eddie Hackett had created a course that soars, swoops, swerves and slides through some of the wildest dunescape you’ll ever see. These looming monoliths are tactical ploys in Hackett’s masterplan. Whether you have to navigate around them on the fairways (being able to shape the ball is a huge plus, here) or climb them to hit tee shots from their summit, they are fundamental to Carne’s incredibly dramatic golfing experience. You need only stand on the tee of the par-three 16th, the green sitting at the foot of an adjacent giant dune, to understand. It feels like there’s nowhere else on earth this place could exist. Hackett vowed that “God’s work would not be despoiled by bulldozers” at Carne – and, in keeping his promise, he has created one of golf’s most memorable and unique courses. Where the mouth of the River Moy first opens out into the Atlantic, you’ll find the final stop on our golfing road trip. 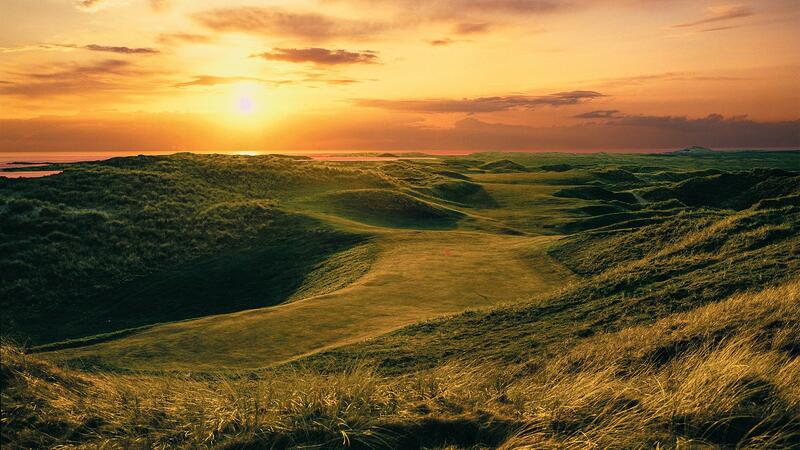 Enniscrone Golf Club, an hour’s journey from Belmulett, barely reveals its charms from the roadside – hidden as it is within a tangle of shaggy fescue-topped dunes – but it’s a beautiful setting for links golf. It has a softer appearance than the harsh Connemara or the wildness of Carne, instead it blends riverland holes with some of the most mountainous dunescape in the whole of Ireland. A winning combination if ever there was one. After four days of spectacular golf, we thought we’d seen it all – and then the 542-yard par-five 14th looms into view, flanked by 90-feet dunes that seem to blot out the sky. It’s a straight toss up between these hulking mounts and the subsequent 195-yard uphill approach as to which is the more humbling. 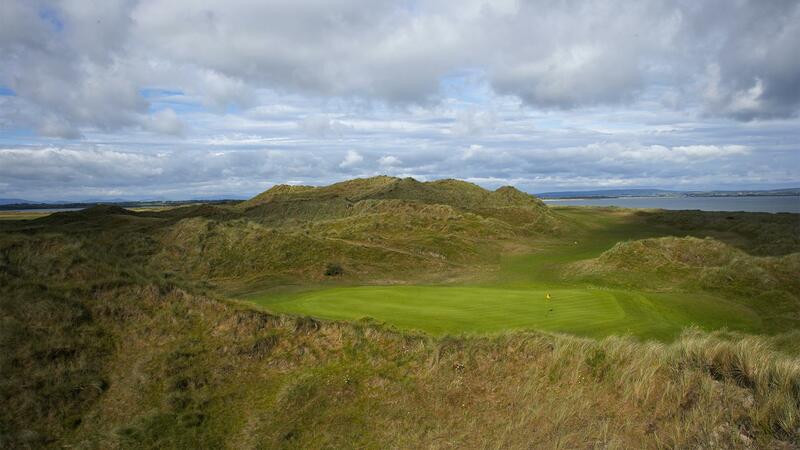 Truth be told, the back-nine at Enniscrone along with the front-nine at Portstewart in Northern Ireland, make up my favourite 18 holes in the British Isles. They both share the spectacular landscape, the challenge and the clever green placements hidden behind dunes (the 421-yard par-four 15th is the easily the smartest hole on the course in that regard). But, above all? It’s the perfect reminder, if it were ever needed, of why we play this silly game. On the course, a stiff breeze coming in off the Atlantic, there’s nowhere else we’d rather be.